Good news has arrived in the U.K. to assuage those fears in the form of 15 newly upgraded Eurofighter Typhoons. For those keeping score at home, that’s five times as many jets as ISIS supposedly has. The upgrade includes integration of the Paveway IV precision guided bomb, full air-to-surface integration including a Litening III targeting pod, and full integration of the IRIS-T short-range air-to-air missile used by all the Typhoon operators except the UK. Other improvements include an updated multifunctional information distribution system (MIDS), Mode 5 identification friend-or-foe system, and improved radios and direct voice inputs. The upgrade will for the first time allow the jets to carry Paveway IV precision-guided bombs that are currently being used by RAF Tornados against [Islamic State in Iraq and Syria] targets in Iraq. The bombs have timed fuses so accurate they can be used to destroy particular floors in a building. The RAF is not the only European air force receiving the newly improved fighter. Since the Eurofighter program is a collaborative effort, partner countries Germany, Italy and Spain will have their fleet of Typhoons upgraded in 2015. 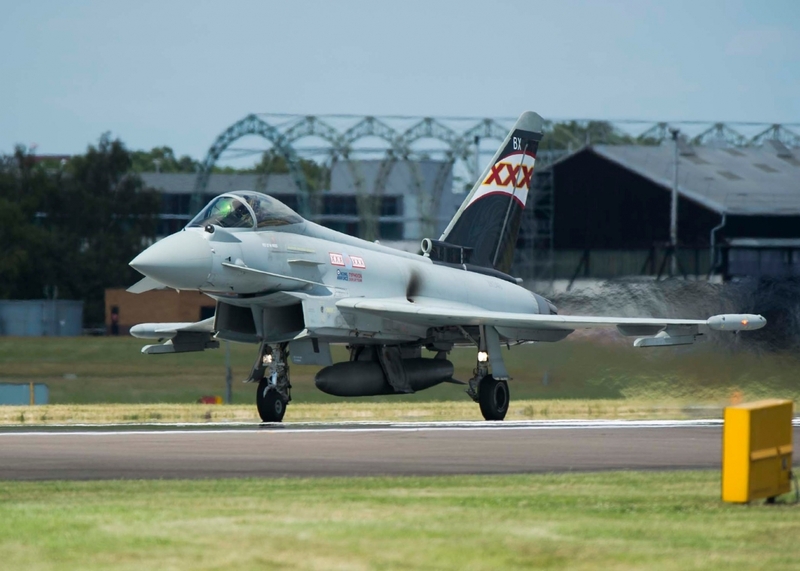 These upgrades have been good news for Great Britain’s BAE Systems, one of the companies involved in the Eurofighter project (Airbus Defense and Finmeccanica are the other two). BAE has a 1.2 billion euro ($1.9 billion) contract to upgrade all 67 of the British Typhoons. ThisisMoney.co.uk points out that BAE is especially grateful for the work after having lost a $10 billion contract to supply 60 Typhoons to the United Arab Emirates. The RAF, meanwhile, had more to look forward to than just the upgraded Typhoons. The service will be getting its first Lockheed Martin-built F-35s next summer. The multiple stealth fighters are expected to complement Typhoon’s updated ground-attack capabilities. Aviation Week says the U.K. is receiving four of the American-made F-35s. Previous articleIslamic State Building an Air Force? OMiG!